Tune in for Midland Community Cavalcade 4:05 to 4:30 PM featuring Midland talent. Penetang Community Cavalcade 5:05 to 5:30 PM featuring Penetang talent. Hear Scotty Attridge with Midland Melodies daily at 11:30 to 12:00 noon. Little more than four hours after he had arrived in Midland for a holiday Monday night with his family George H. Preston, 51, of Chatham Ont. was struck and fatally injured by a motor car. A 23 year old Lindsay Street resident has been charged with criminal negligence and careless driving. Having walked to the Parkside Inn for a snack Mr. Preston, his wife and 9 year old son were walking in a westerly direction along Hwy 12, a continuation of Yonge Street on their way back to the Shamrock Motel when he was struck by a car passing another in the same direction. Midland Council gives formal approval to the construction of a new $160,000.00 town hall on the site of the former Central School. Entering the building by the main entrance off Dominion Ave. the visitor will be able to reach either of the two floors in the east wing by going up or down short flights of stairs. To the right, or west, is the main council chamber capable of seating between 200 and 224 persons. Starting from the southeast corner provision has been made on the top floor of the east wing for offices of the school inspector, Children’s Aid Society, the mayor, engineer, assessor and the municipal departments, as well as storage and washrooms. Plans for this floor also include a family court room. The council chamber will double as a court room. Housed on the ground floor of the east wing are the Chamber of Commerce offices, the police and fire departments, a band room and the boiler room. There will be room for the present two fire trucks and one more larger vehicle. Provision for six jail cells has been made including one for the lady guests. Total floor area will be 16,000 square feet at an estimated cost of $10.00 per square foot. Bulk Milk Hauling Plan Hits Local Producers – Bulk milk hauling introduced by Barrie’s Lakeview Dairy has cut off a number of North Simcoe producers. The dairy had 99 local suppliers, now the number has been reduced by two thirds. Only two suppliers in Vasey and one in Waverly are equipped to sell to the Barrie firm. Reeve Roy Hickling explained that under the bulk plan milk is picked up every second day in a truck that weighs 30 tons loaded, no individual cans are used. Each supplier has to spend about $2,500.00 for extra cooling equipment and will have to improve their farm lanes to handle the large milk truck and keep them plowed in the winter. Those cut off will be helped by the extra demand from tourists in July and August. 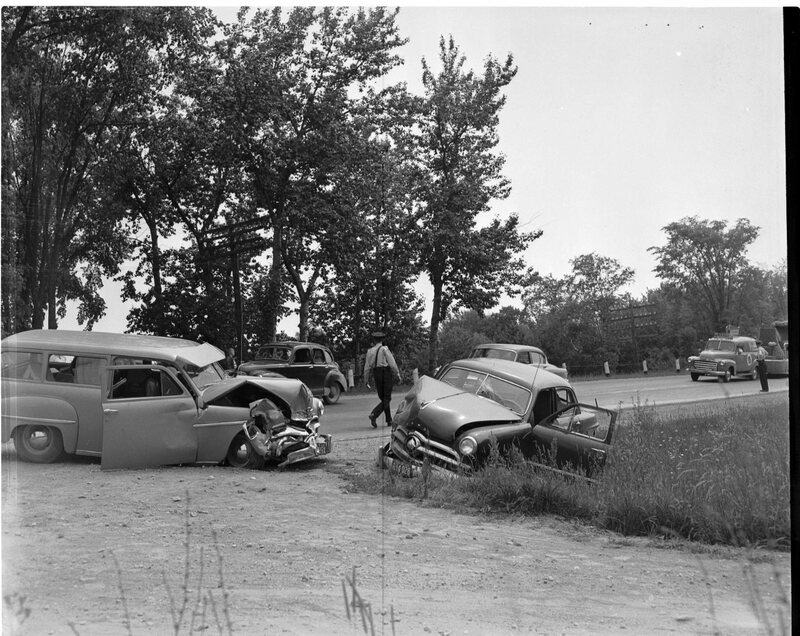 Two car accident, one of five in the area over the weekend, Hwy 12 near the Old Fort Road, station wagon driven by John Hartford of Port McNicoll and the car driven by Helen Butzer of 286 (308) Queen St. Injured was Roy Smith of 211 (233) King Street. Organized picnic for the sightless. Over one hundred blind persons from all over Simcoe County and their escorts attended a picnic in Little Lake Park on June 29th. 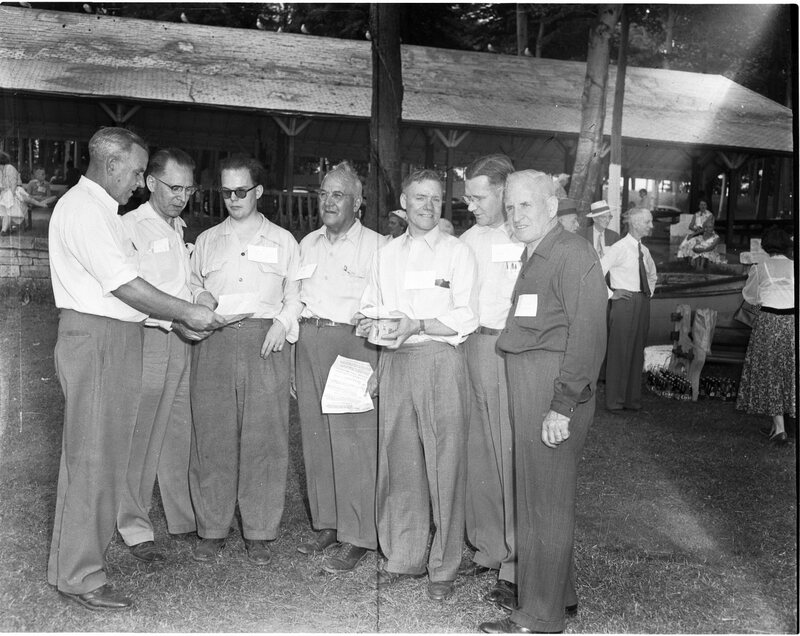 Advisory committee members, Ed Broomfield, Orillia; A. H. Tweedle, Midland; Bill Murdock field secretary, Barrie; Art Pugh, Barrie; Jack Walton, Orillia; Lorne Ball, Victoria Harbour and Gilmour Nesbitt, Midland. 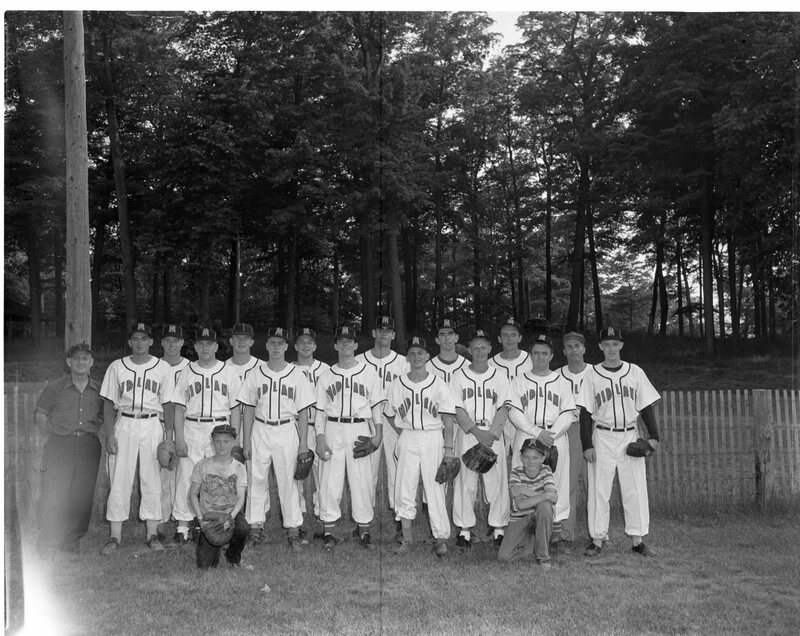 “All dolled up and going places“ Midland Indians in their new uniforms, John Hill, Paul Dubeau, Murray Yorke, Dave Hart, Floyd McDermid, Jack Hendrikson, George Gouett, Jim Lemieux, J.B. Robitaille, Joe Faragher, Morley Shaw, “Buck” Rogers, Harold Jackson, manager, Herb Beauchamp and Bev Wilson. Bat boys, Bob Jackson and Kevin Rogers. American League Champions, Cleveland Indians, gather around their coach. 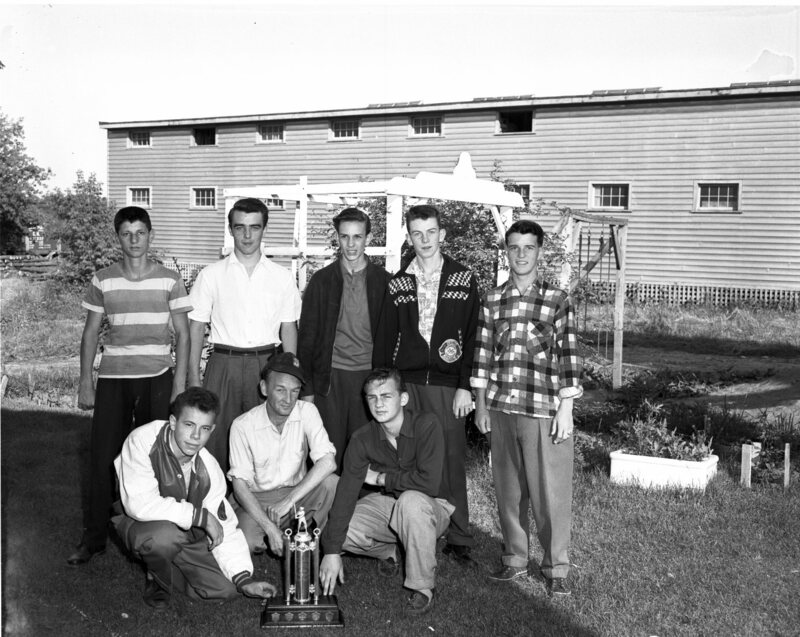 Back row, Buzz Deschamp, Wayne Morrisson, Paul Crawford, John Armstrong and Bob Abbott. Front, Bob Hendrikson, Garnet Haines coach and Sheldon Haines team captain. Absent, Gary Keeler, Frank Koening and William Offord. Senior boy and girl merit awards were presented by the Midland Home & School Association before a capacity crowd in the Midland District High School auditorium. 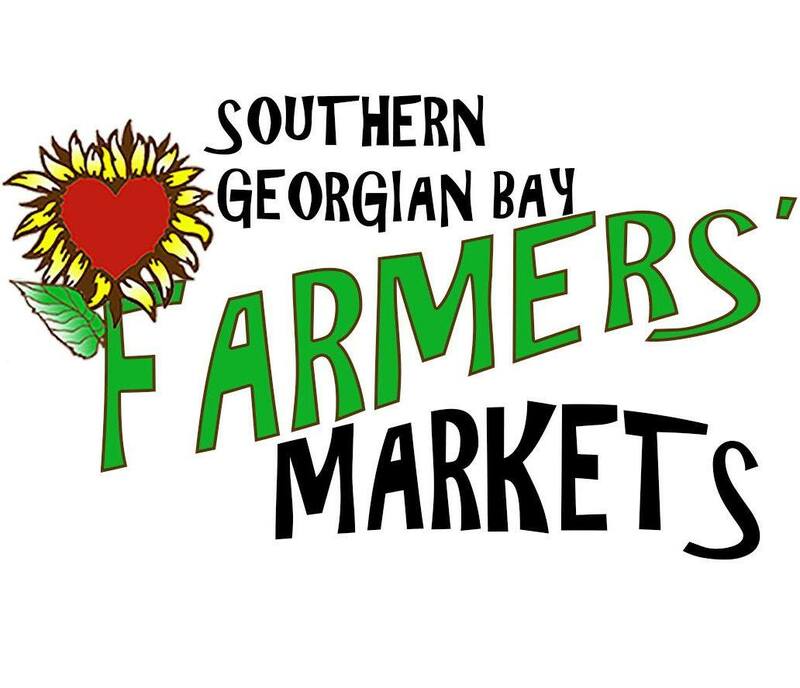 Presented by Mrs. Allan Perkins, past president of the association. 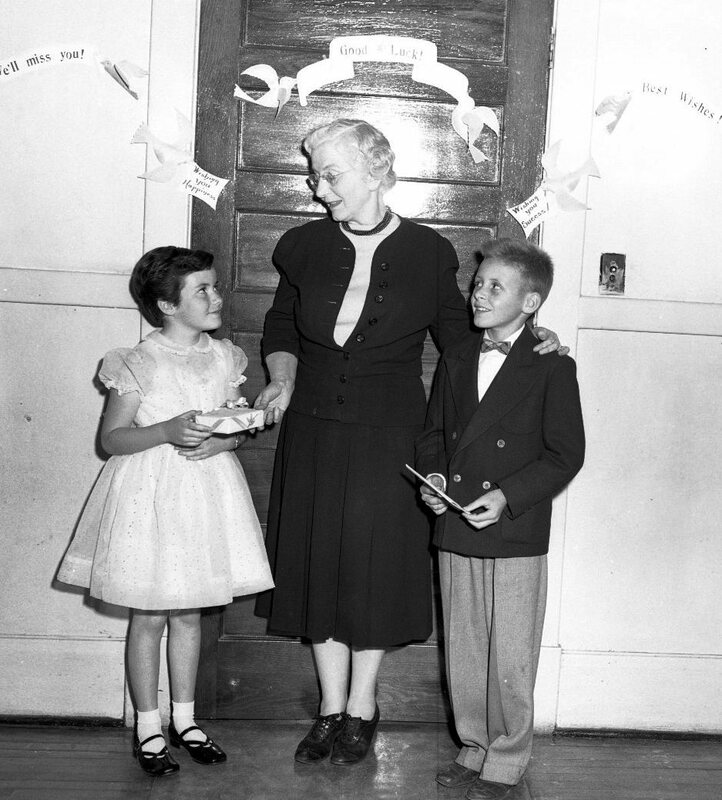 Mary Ann Nicholson, Regent School, Carol Ann McConnell, Sixth Street School, George Haskill Jr., Regent School and Frank Okenka, Sixth Street. First internment in the Union Cemetery in Victoria Harbour is recorded on this stone in the Stewart family plot. Made in 1880, it was Joseph Stewart, nine year old son of Mr. & Mrs. David Stewart. 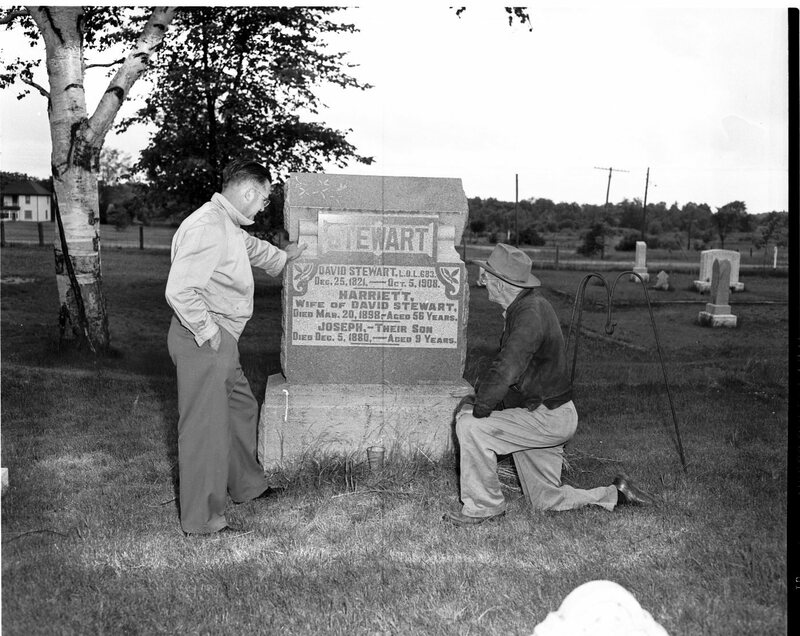 Board secretary Lorne Ball and Chairman Alvin Crooke examine the grave stone. 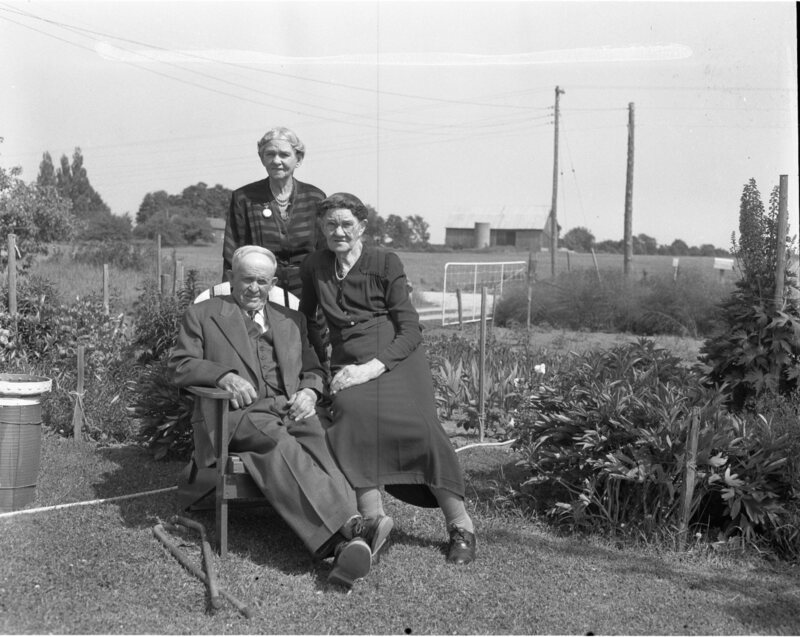 Wed fifty years – Mr. & Mrs. Ida Quesnelle, Penetang, both born on farms in Tiny Twp, lived most of their lives on a farm near MacIlvalley school. 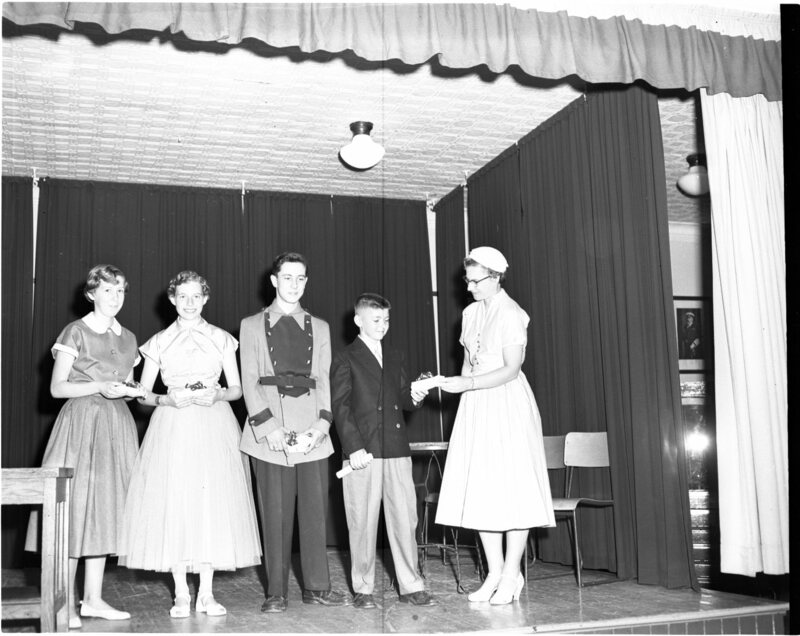 Three sons, Joseph, Romeo, and Roger, five daughters, Mrs. Art Bellisle, Mrs. Lionel Marchildon, Mrs. A Pilon, Mrs. Alex Cusson and Miss Loretta. Well known Tiny Township residents Mr. & Mrs. Samuel Lyons celebrate fifty years of married life spent on the same farm in the Wyebridge Wyevale area. Mrs. Lyons sister Mrs. Sarah Guest stands behind the couple, she has been a Midland resident of thirty years. 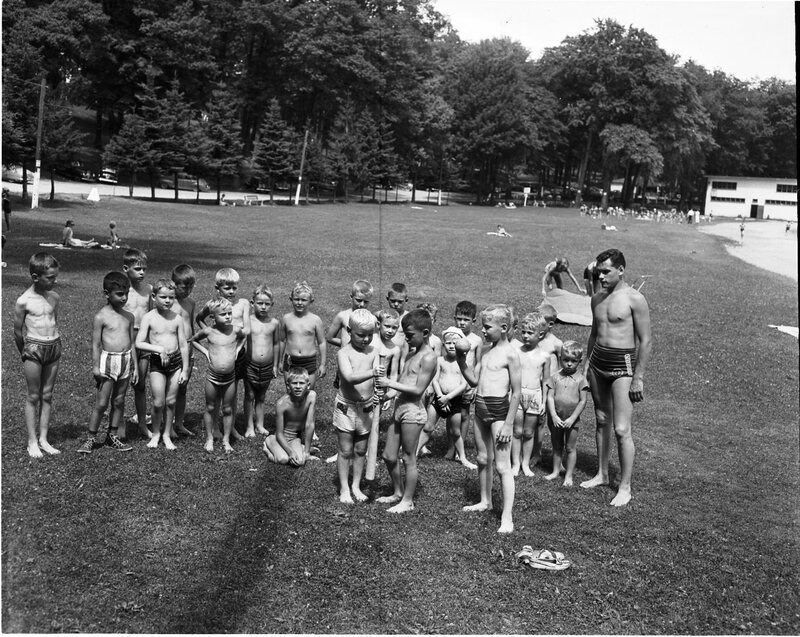 Doug Swales, director of the Midland Y’s Men’s Club summer playground program, watches over a group of boys choosing sides for a ball game. Miss Genevieve Doyle a teacher at St. Mary’s Separate School in Midland for three years and Sacred Heart for nine years has taken a position in Oshawa this fall. Held in high esteem, she is receiving a presentation from Nelson Cote and Jane Campbell, two of her grade 4 pupils.